The project is about in-situ conservation of isolated populations of endangered primate species – Sclater’s guenon (Cercopthecus sclateri), Putty-nosed monkey (Cercopthecus nictition), Mona monkey (Cercopthecus mona) and Red-capped mangabey (Cercocebus torquatus) – occurring within Ikpa River basin in Akwa Ibom State, Southern Nigeria. It is aimed at preventing local extinction of globally important primate species occurring within the locality. To undertake an ecological survey of the forests with a view to identifying suitable locations where viable population of endangered primate species could be conserved. To facilitate establishment of Community primate conservation bye-laws and a long term participatory conservation plan: preventing further destruction of the primate sanctuaries. 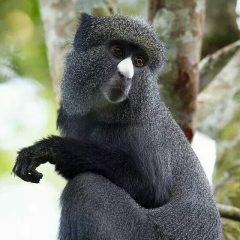 To sensitize the community people on the conservation needs of primate: targeting about 2000 members. To build capacity of community farmers (about 100 persons) on forest friendly agricultural practices (organic farming, agro forestry) with potentials for high yield but do not support further forest destruction. To enhance livelihood skills for about 30 forest dependents (hunters, loggers) in alternative livelihoods (snail farming, beekeeping; aquaculture). To restore degraded portions of the river basin by planting native tree species, targeting up to 2000 tree stands: restoring/expanding the habitat for the primate species.